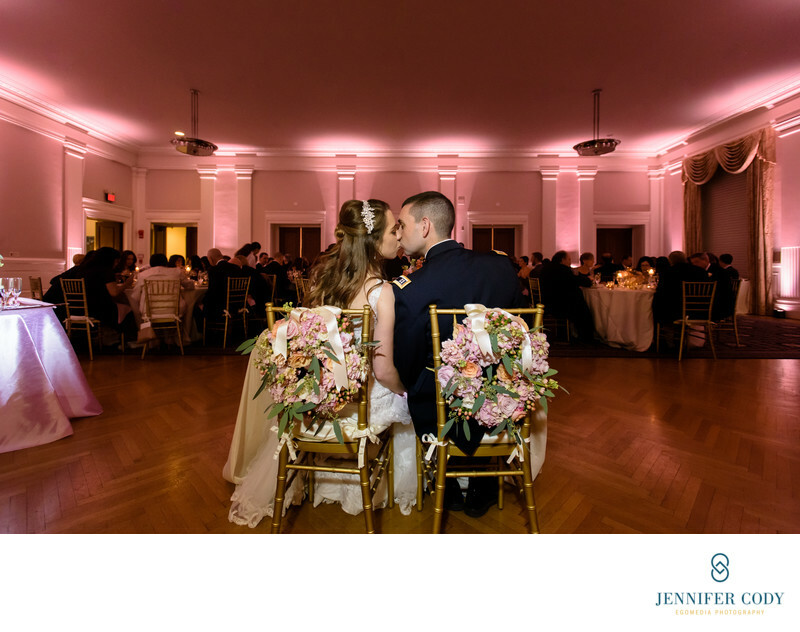 This Carnegie Institution wedding reception was filled with beautiful flowers and candlelight! Beginning with their getting ready at the Willard, E&E were surrounded with their family and friends. With a December wedding, we expected cold temperatures but it was surprisingly warm for their wedding day! The ceremony took place at Holy Rosary Catholic Church in downtown Washington, DC. E&E chose to have a full Catholic mass to celebrate their marriage. Catholic weddings have the advantage of typically creating a break between the ceremony and reception, time which we can use to take beautiful photographs! After the ceremony concluded, we took some time for portraits. The bride and groom brought their bridal party along for portraits and of course, to make the whole process even more fun! Once we finished with the posed portraits, it was time to head back to the Carnegie Institution to enjoy cocktail hour with E&E and their family and friends. After cocktail hour, E&E invited everyone into the ballroom for a seated dinner. The lovely flower centerpieces made the room look especially beautiful and of course, festive. Flower wreaths marked the bride and groom's chairs. The floral was designed by Petal's Edge. During dinner, the couple enjoyed listening to toasts from their wedding party and gave a thank you to their guests. Dinner was followed by dancing in the atrium, which started with the first dance and parent dances. Location: 1530 P St NW, Washington, DC 20005.